Memories………..Every little girl will always remember her First Communion for the rest of her life, and so, here is where Communion plays an extremely important part in this holy ritual.Choose from our fabulous collection of first communion dresses - the most beautiful organza princess style gowns with sequins and or beads with matching veil that will make her feel so special on her special day. How about simple satin girls communion dresses accented with lace and perhaps a sleeveless bodice or some dresses do come with a jacket that can be worn with or without for a different look each time. Accompanied by coordinating first communion accessories such as satin or organza gloves, satin ballet slippers or shoes and stockings, and your child is all set for that very special day. 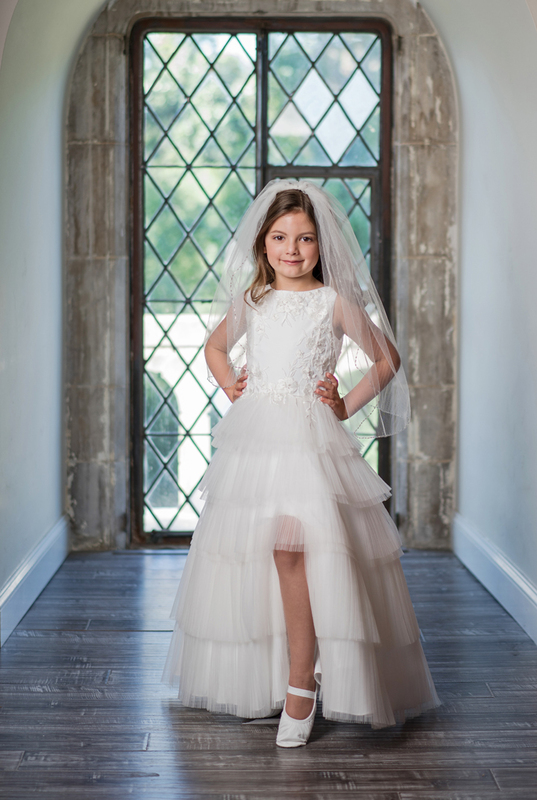 So, check out our exquisite collection of beautiful white first communion dresses, all perfect for that special day in your child's life. The choice is wide...the selection is simply fabulous! A lot of our girls communion dresses that are shown as colored dresses are also available in white. So, please do not hesitate to contact us by email or phone with any questions or concerns you may have regarding our first communion dresses.